Journal of Frankenstein magazine #3 40th Anniversary Celebration Continues! MyMovieMonsters.com > Monster Magazine Marketplace > Journal Of Frankenstein > Journal of Frankenstein magazine #3 40th Anniversary Celebration Continues! 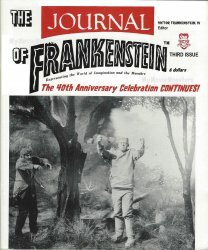 The Journal of Frankenstein 40th Anniversary Issue #3. Representing the World of Imagination and the Macabre. Issued in July 1999. 68 pages. Two-color cover and B&W pulp pages inside.